Some diamond enthusiasts are gearing up to solve a mystery of fraction comparison. They have come across a few gold boxes and a weird machine with missing gears. It is rumored that some of the boxes contain diamonds, while the others contain bombs. After careful inspection of the machine, they realized that the missing gears have symbols that might coincide with the boxes with diamonds. With your great deducing skills and a keen eye for details, your task is to identify which gear is the right gear to use. To do so, you need to match the right comparison symbol to the fractions given. Each gear has either a <, >, or = symbol in it, and the missing gear coordinates with the matching box to solve the puzzle on which box contains the diamond. Compare the two fractions given. See if their values are equal, bigger than, or smaller than the other. With your answer in mind, drag the gear to compare the numbers and submit your answer. The correct gear will start the machine and have it direct you to the right box containing the diamond. Careful, because inserting the wrong gear will direct you to one of the boxes containing an explosive bomb! 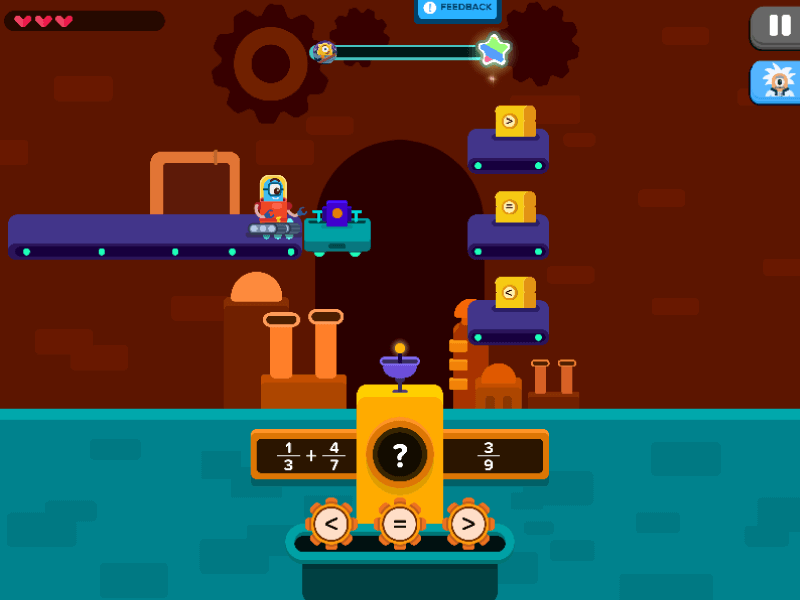 Gear Fractions is a game that trains your understanding of fraction comparison. The fractions are shown either as a single fraction or as an addition of two fractions; either comparing the same denominators or different denominators. The best way to approach the comparison of the two fractions is to find the equivalent fractions that makes both sides have the same denominator. Let’s gear up to convert some fractions!